Steel Water Well Pipes, Greece, Attica | Metallourgia Mandras S.A. The steel tubes produced by METALLOURGIA MANDRAS SA are distinguished for their high quality due to both their modern mechanical equipment and their continuous monitoring. 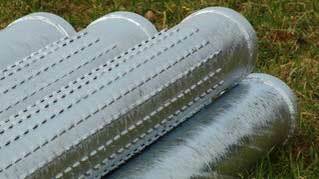 Among its products there is also a wide range of steel pipes and fittings for irrigation and water supply use. The high technical and quality specifications of steel pipes depend directly on the quality of the raw material and the production line. Steel pipes are produced from coil of various widths and thickness according to customer request. Steel is imported or purchased mainly from major Greek and International companies. The selection of these companies is based on strict quality standards applied by the Quality Control System. It should be noted that the pipes undergo at all stages of the production process a series of tests and checks, in order to fully ensure construction quality and reliability, according to each customer’s specifications. The sheet steel used for blind pipe manufacture is S23JR, 3-6mm thick, in single pieces up to six meters. The pipes are measured in accordance to API 5A. Blind pipes are longitudinally welded ER/HFW (Electric Resistance/High Frequency Welding) as per DIN 1626/2458 – EN 10219 or Mig-Pulse welded. The bridge type slotted screens manufactured as per DIN 4922 are made for longitudinally welded base pipes ER/HFW (Electric Resistance / High Frequency Welding) as per DIN 1626/2458 – EN 10219 or made for Mig-Pulse welded pipes. The screen sheet steel is of S235JR, 3-6mm thick in single pieces up to six meters. The pipes are measured in accordance to API 5A. The filter’s bridges and slots start from 25cm from the welding point of the female connector and 20 cm from the welding point of the male connector. The opening of the bridge is 1,00 m/m to 3,00 m/m. Diameters 4 ½”, 5 1/4 ”, 6 5/8, 8 5/8, 10 ¾, 12 ¾, 14΄΄, 16΄΄, 18΄΄ refer to external diameters without the filter or slot of the tube. The free surface is at least 10% of the filtered segment. The connections of pipes and screens are manufactured under European specifications. They have semicircular thread with 2 coils/inch and a depth of at least 70 m/m from the edges. Their length is at least 100 m/m to 120 m/m and their thickness varies from 12m/m up to 15 m/m. The steel pipes and screens can be hot or electrolytically galvanized, they may be black steel or bitumen tar enamel coated. Below you can see the dimensions of the products. Please click the link below to print the table.